UPDATE: Corrected explorer background color issues in theWindows 10 sub-style. 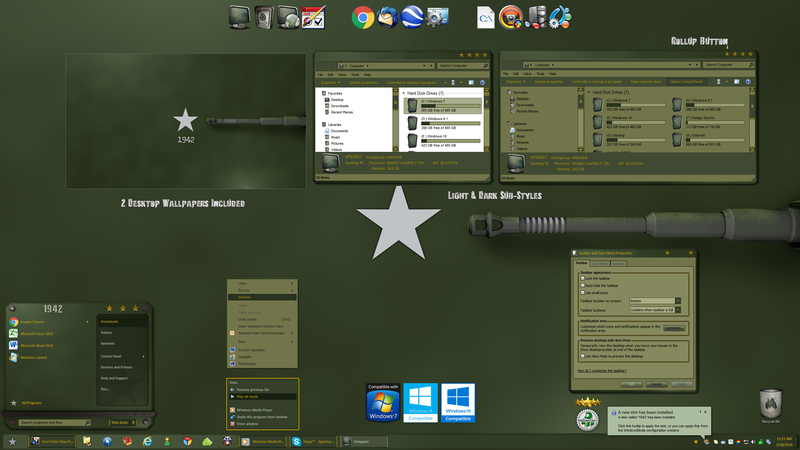 Welcome to the world of 1942, a patriotic Windowblinds skin that has been designed for Windows 7/8 and 10! Based on the colors of the U.S. Army/Air Force of the time, and there are dark and light sub-styles for each operating system included. It has been designed with a roll-up button and comes with the desktop wallpapers shown in 2560 x 1440 and 1920 x 1080 resolutions. Once again, many thanks to RedNeckDude and vStyler for their assistance with this skin, thanks guys!! Be sure to grab your copy of 1942 today, and thanks for your continued support of my work. Enjoy! A very nice Tribute. Looks great. This is one nice skin! I love the nostalgic look of it. Thanks Tom! Based on the video game or the movie of the same name? Or none of the above? Either way, it is very nice, Tom! I've always enjoyed military themes! Did not even know there was a video game or movie of the same name. "Love the way they look JC, upload them here whenever you want. I'll just get them after you up here. I don't use xWidget though." Well, we're going back a nice ways but there was a John Belushi movie directed by Steven Spielberg in 1979 called 1942 which I'm not surprised if you haven't heard of it; it was one of Spielberg's few flops. He tried his hand at comedy, which let us just say is not his forte. And the other 1942 was an arcade game set during World War Two and came out around '81 or '82, I believe. Not a bad bang for the quarter if you enjoy mindless shoot 'em ups! Did not even know there was a video game or movie of the same name. Well, we're going back a nice ways but there was a John Belushi movie directed by Steven Spielberg in 1979 called 1942 which I'm not surprised if you haven't heard of it; it was one of Spielberg's few flops. He tried his hand at comedy, which let us just say is not his forte. And the other 1942 was an arcade game set during World War Two and came out around '81 or '82, I believe. Not a bad bang for the quarter if you enjoy mindless shoot 'em ups! Ahhhh OK. I was all over the place in the military for those years, and many others, so not surprised I did not know about those. You didn't miss out on much. Also, I would like to add the Organic iconpackager theme you chose for your screenshot goes absolutely perfect with the military theme; almost like it was designed for your WindowBlind. Just up my street! Thanks Tom, great work! Yes, Camouflage was a great skin. Got rid of my domains almost 7 months ago, be releasing my skins here on WC in the future.